Momo Taro at Storm King. Uploaded to Flickr by Sushicircus. location: Storm King Art Center, Mountainville, New York. commissioned: by Storm King Art Center. condition: waiting patiently to be touched and enjoyed. 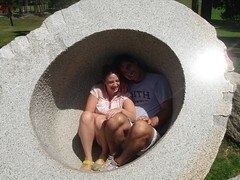 I love this photograph of a young couple inside the egg shaped void of Noguchi's Momo Taro located at Storm King Art Center in New York. The name Momo Taro comes from a traditional Japanese folk tale told to children about a boy born from a peach. In a 1997 documentary film Noguchi is shown working on this sculpture in a documentary film in which he discusses the origins of the work. He explains that he was commissioned to do an outdoor sculpture in the landscape for Storm King. He sought out massive boulder to use and found one in a remote stream. The stone was so huge it had to be split before it could be moved. Splitting a white rounded form was a theme in Noguchi's work going back at least to his proposal entitled Play Mountain where a band shell was to be formed from two sections of an egg shaped mass. 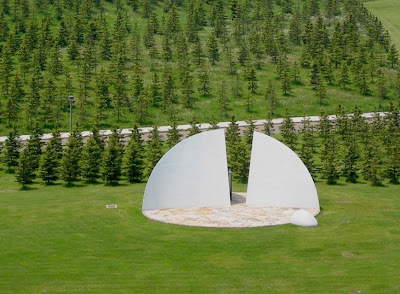 You can see the work as it was constructed following Noguchi's death at Moerenuma Park in Sapporo. Uploaded to Flickr by ellen's attic. You can read an interesting comment by a recent visitor to Momo Taro who had been warned not to touch any of the sculptures on display and my response to his visceral reaction to Noguchi's powerful design. Hey, that is me in the photograph. Storm King is such a fun place to visit and climbing in the Peach was a highlight. I like your blog! Thanks Kellie. So glad you enjoyed climbing into that carved out hollow. Unfortunately, some people are being told "not to touch the sculptures" which I think is exactly the opposite of what Noguchi would have wanted.